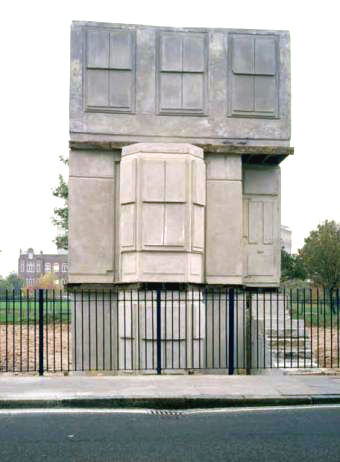 House, perhaps Whitereads best known work, was a concrete cast of the inside of an entire Victorian terraced house completed in autumn 1993, exhibited at the location of the original house — 193 Grove Road — in East London (all the houses in the street had earlier been knocked down by the council). It drew mixed responses, winning her both the Turner Prize for best young British artist in 1993 and the K Foundation art award for worst British artist. Nineteenth-century sculptors referred to the process of bronze casting as life, death, and resurrection as the original live object was destroyed in the casting process and resurrected in bronze. 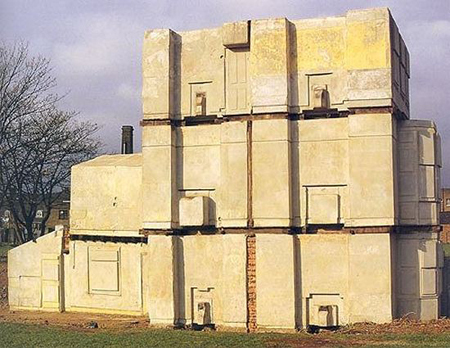 In a similar but distinctly different manner Rachel Whiteread casts the space inside, around, and adjacent to objects that have been part of people’s lives. This process and her choice of materials transform the residue of everyday life into ghostlike, uncanny spirit images of everyday objects. Rather than using the traditional casting process of making molds of objects and then casting them in a different material, Whiteread uses the objects themselves as molds. For example her 2002 sculpture “Sequel IV”, is a casting of the enclosing space surrounding the backs of a library shelf done in plaster. 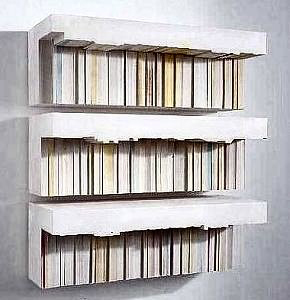 This is a reversal of a bookshelf as the titles are hidden and the books inaccessible. Instead of inviting browsing, these books are inaccessible shadows, frozen in time, reflecting hidden knowledge. It is as if we came upon an ancient ruin of a library. This entry was posted on vrijdag, februari 6th, 2009 at 08:17	and is filed under Archaeology, Petrology, Visual Arts. You can follow any responses to this entry through the RSS 2.0 feed. You can skip to the end and leave a response. Pinging is currently not allowed.